We appreciate your Facebook "Like"
During the approximately 3 weeks prior to writing this "How to Take Good Photos on Vacations" page, I was working on selecting about 130 "Top Pick" digital scenic photo favorites from about 11,000 US Scenic Vacation Photos I had taken over the last 30+ years of my Wife and My Travels & Vacations in the US. Why this "How to Take Good Photos" -- Digital Vacation Photography Tips page? If I do "fiddle" with lens Aperture or shutter speed settings, do not do it Via "manual" settings, instead do it Via the "Scene Select" Dial on the Canon camera to select "Category" automatic scene settings such as: "Landscape" - "Kids & Pets" or "SCN" -- which has special sub-categories such as "Beach" - "Foliage" - "Snow" - "Indoor" - "Night Scene" etc. My digital scenic vacation photos in recent years have been with a fairly basic "Point & Shoot" Canon PowerShot SX100IS with a built in 10x Optical Image stabilized Zoom lens. My current (11/14/2013) recently purchased new camera is a well User Reviewed Canon Powershot SX280 HS Digital Camera with a 20x Optical Image Stabilized Zoom and a wide angle lens + 1080 pixels wide HD Video capability. The Canon SX280 HS also has a GPS Location Tracker that puts the location where you took your photo in the photo image file so you can later view where your photo was taken on a map using Canon Software. Also really like the fact that the SX280 HS is still smaller handy "pants pocked sized" like my old SX100IS, Vs so big that you have to carry it swinging on a strap around your neck! Why Use Your Camera's "Automatic" Settings? The real point of using your camera's built-in "Automatic" setting is so you have more time to focus on the "Non-Technical" subject matter or focal points in your Scenic Vacation Photos plus the composition of your photo subject -- so you can take more, better composed, and more interesting to view pictures!!! -- Vs having to spend so much time doing all of the special camera setting Technical "stuff" which a good digital camera can actually do for you very well in one of the "Auto" Scene Setting Modes! Plus you then have more time to take extra slightly varied shots and "backup" shots -- and do some fine tuning on your photo composition + find more good subjects to photograph! -- see Tips # 1 and # 2 below. -- Plus -- Our Web Site and Photo Viewers download a lot of photos from our 4 US Vacation Sites + at GeneSeecann.com Photos, so my Canon camera must be doing the "Technical" aspect of the Photo Taking process very well in the "Auto" mode. The, I believe, more important to your photo viewers, "Non-Technical" part of the basic photo taking process is covered in the 5 "How to Take Good Photos on Vacation" Photography Tips below. If you are a Photographer ("Hobby" or otherwise) and would like check out selling your Images online at a very popular Stock Image Photo Downloads Site, see more Info on setting it up at this link - Sell your Photos Online - I have used them for over 4 years and have been very happy with their service. # 1. 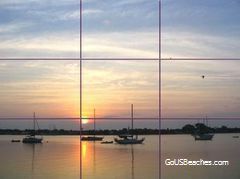 Have a Photo Focal Point and Place it in your Picture using the very Important Basic Photo Composition "Rule of Thirds"
Many "Technical" Photography Tips articles say the "Rule of Thirds" is often one of the first "How To's" taught in Photography Schools. It was one that thank goodness I learned early at a "Landscape Photography" day seminar that I took many years ago -- along with the "Take many shots" Rule #2 below! for a picture taken in the horizontal plane. luck out & get the 2 flying birds + reflection in same Photo. We won't go into some of the eye movement and other studies that led to or that back up the importance of the Rule of Thirds in Photography, but according to many Photographers, centered scenic or landscape photos -- or "centered" photos of most types -- are "Boring" to the Viewer. The rule of thirds basically says that you mentally draw two horizontal lines on your viewing screen or viewfinder dividing the screen into thirds vertically, as well as two horizontal lines so you divide your prospective image into thirds in both planes. Then, place the focal point of your photo on or very near one of the "thirds" lines in your screen "grid." The Photo above illustrates this for a photo taken in the horizontal plane. This # 1 Rule of Thirds Tip is very important for most types of Photography -- it is one of the most important "Non-Technical" Landscape and Scenic Vacation Photography Tips that you can easily use to improve your vacation photo memories! Quickly changing sunrises and sunsets, ocean waves and surf photos, and any pictures with wildlife can be particularly important for this! No flash is so you don't have to deal with "red eye" and reflections on glasses + nothing is "candid" after the first flash goes off! Kids are often moving and are blurred in your lower light no-flash indoor shots! For indoor group "posed" shots of Kids or Adults, someone always blinks -- especially if some other photo takers are using flash! -- Allow for that by taking extra photos as backups!!! This is so simple to do. Don't waste your time "Reviewing" each of your individual photos in the small camera viewing screen where you often cannot see minor blurs or composition flaws -- just take a couple more quick pictures!!! You can vary your photo's focal point location and composition slightly and also take a couple of photos from a slightly different position if you have time. You can always delete down to your top photo favorites later when you can look at them larger size on your computer screen or on your HD TV!!! -- it is so easy now with digital picture files as compared to the "Old Days" when we had to wait for the expensive prints after we returned from our vacation travels! You will learn this #2 Rule the "Hard Way" a few times when you later find flaws in some very important shots that looked OK in the small camera Viewfinder photo "Review," but were ones that you had not bothered to take "Back Up" or alternate composition pictures for. It is very hard to go wrong by taking a few extra digital shots of an interesting subject!!! -- especially when you have spent a considerable amount of travel time and vacation dollars to get to that Scenic Vacation Photo location! -- Why get more Photo Memory storage cards? -- So you don't ever have to waste precious daylight vacation time trying to figure out which "bad" photos to delete off of a full camera memory card using your small camera viewing screen during the day -- when you could be seeing more scenery and attractions and taking more vacation pictures! This #2 How to Take Good Photos on Vacations "Non-Technical" Vacation Photography Tip could you save you a lot of disappointment from bad photos that show up later when you view them larger on your computer and see flaws that you did not notice when you took the photo. A few extra memory cards are cheap compared to missed vacation photo memories! # 3 "Frame" your shot on a side or two if possible (with trees, low hanging limbs, the beach, etc) + look for items of interest in the foreground to help give your photo "depth" and make it more interesting. 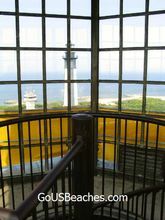 Or, when taking shots of the ocean beach from your Oceanfront Condo Balcony or the open viewing deck at the top of a lighthouse you have climbed to the top -- have a section of the balcony railing in the shot to give perspective and depth -- and even to help frame the shot. Tip - Don't try to "crop" your photos too close with your camera Zoom when you are framing your shots. You can do that better later with your Image Editing program when you have more time, are viewing your photo in a larger screen, and aren't risking chopping off the very top of a lighthouse or a mountain peak! Also, sometimes there are some interesting Photo "setting" and "context" tems in the foreground or along the sides that can add interest to your vacation photo that you may miss while taking the shot, but would have been gone forever if you had cropped your photo too close "in the field." Any needed photo editing to level a tilted horizon in photos with your Image Editing software later also emphasizes the importance of not cropping your photos too close "in the field" mentioned in the Tip above -- so you have some image around the edges to "lose" in the leveling cropping process! Tip 2 - Turn off "Digital Zoom" in your camera settings so when you are using your camera zoom, it only zooms to the extent of your Camera's Optical Zoom, and also doesn't utilize the lower quality digital zoom where your photo image can get fuzzy or "grainy." You can always crop out an area you want zoomed in more with your photo editing program and get a higher quality image. My favorite photo editing program is the highly reviewed downloadable, Free, and very easy to learn and use XnView basic image editor and fast loading image viewer. User reviews and download link for the XnView program are at this XnView Download.com page. My favorite Photo Organizing, "Tagging," and Sharing Photos program is the recently upgraded and easy to use CyberLink MediaShow 6 -- CyberLink MediaShow-Organizing, Creating and Sharing your Photos and Videos. MediaShow 6 even has very fast and accurate Facial Recognition capabilites + it can put your Photos on a Timeline in it's searchable database. -- Then you can quickly and easily for example Face Recognition Tag all of your Photos of your Grandkids -- and then easily search for all photos with a certain Grandkid in them taken in 2007. The new CyberLink Media Suite 10 includes the MediaShow 6 above and has a total of eleven seperate programs to use to Organize, Edit, Produce, and Share Photos and Videos + Create and Burn Slideshows and Videos. -- More Info at: CyberLink Media Suite 10 - Organize, Play, Edit, Burn and Share! The Tip #3, Framing your shots, can end up being an important how to take good photos vacation photography Tip to giving you more "Top Pick" photos from your vacations. the winding valley road to distant focal point. This is not appropriate for many photo topics, but a lot of photo subjects lend themselves to a "Story" sequence. For example, a lighthouse series of 3 to 6 photos: You could take the first shot from a distance showing the rocky coast (the reason the lighthouse is needed!) 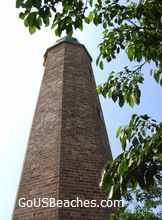 or the high point the lighthouse sits on, a 2nd photo from fairly close showing the immediate lighthouse setting, the lighthouse paint pattern, and the walk or stairs up to the base of the lighthouse, a 3rd shot from close to the base looking up at the lighthouse tower structure to emphasize the height + show a close up of the painted design and construction, a 4th photo of the spiral steps going up or down inside the lighthouse, and a photo or two of the great view from the open viewing deck at the top. Tip - Remember to include a piece of the viewing deck railing to emphasize your height when taking the top photos. 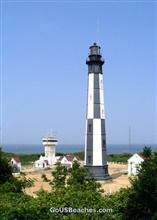 The photo sequence below is of the old and new + "newer" Virginia Beach Historic Cape Henry Lighthouses. 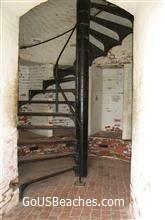 The 2nd photo -- "Stairs to Light" is one of my "reflective" vacation photo favorites -- plus for the "memory" of the many steps we climbed at the Cape Henry Lighthouse! 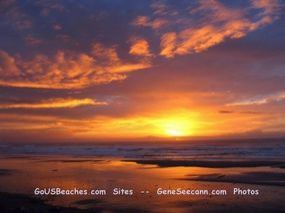 -- This vacation photo has now moved up to page 2 of the most viewed photos at GeneSeecann.com Photos. The last "New and Newer" Lighthouses photo in the sequence is now one of the more viewed and downloaded photos at at GeneSeecann.com free Photo Previews and High-Resolution "Stock Photo" Downloads + Viewer Stats. Will try to not get too "Technical" with this last Tip. Good Scenery and Landscape photos are pictures where you usually want a wide "Depth of Field" -- that is, objects in both the foreground and in the distance to be in focus, unlike wanting only the subject's face in focus and the background to be blurry as in much Portriat photography. Any time you or the automatic computer settings in the camera slow down the shutter speed, you run an increased risk of your image blurring from camera shake. Camera Image Stabilization can correct much of the small instances of camera shake, but sometimes not all -- expecially any "big" shakes. -- Thus the need for a Tripod or Monopod to steady your camera is often very important in much landscape or scenic vacation photography. This is especially the case if you are using your camera's built in optical zoom at a setting of 3x zoom or more where vertical image "shake" starts to become a major factor. According to many landscape photography articles, tripod or monopod support for your camera to prevent blurring or "fuzzy" shots is generally also needed when the camera shutter speed gets slower than 1/60th of a second. Tip - A monopod is also very handy in taking video horizontal "panning" shots and "stitched" horizontal panorama multiple photo shots. A tripod will do everything a monopod will do and more to stabilize your camera, it is just that tripods are usually heavier and much "clunkier" to carry around than a small quality built collapsable lightweight monopod. Since a monopod is easier to carry and use, you will tend to use it more, and the result will be less "blurry or fuzzy" vacation photos! The well user rated monopod that I purchased and have now carried and used with good Landscape and Vacation Photography results for several years is the Opteka MP100 67" Pro Photo / Video Monopod available at a discount from Amazon. This lightweight, but sturdy, monopod collapses to 21" long, has a cushioned hand grip to help hold the camera steady and for use as a walking stick, and has a handy canvas carrying case. Important Backup Tip - BACK UP YOUR PHOTO PRINTS & DIGITAL PHOTO FILES!!! -- Scan your favorite Family & Vacation Photo Prints into digital image files, and then back up those photo image files from your computer to an external hard drive. I read recently that having a computer hard drive fail is comparable to having a house fire. Having had two different hard drives fail, I can personally attest to the fact that it wastes a lot of time to fully recover from -- even if you do have good backups! I "try" to remember to back up my desktop computer to my External Western Digital 1 TB Hard Drive every Wednesday night. We store our favorite prints and "off Computer" back up files External Hard drive in heavy plastic bags inside a fairly large, heavy, waterproof and fireproof chest in a corner of our basement -- along with some DVD disk back-ups of some of our important family photos as an added precaution. (I was once a Boy Scout Leader, so am taking the "Be Prepared" for everything that can go wrong motto seriously!) Plus, I have had 2 (Two) hard drives fail in the last 12 months, so I am a bit "paranoid" about loosing my Photos -- and other files! We gave each of our Kids a waterproof/fireproof chest a few years ago to store their own family photos and important papers -- plus several DVD's of our family event and vacation photos up to that date. Now at Christmas, we give them one or two additional DVD's with that years family photos taken since the prior Christmas -- so now they also have copies of all of our family and vacation pictures! 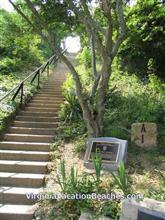 Plus see "Top Selections" Photobucket Vacation Album link below. Hopefully this Non-Technical article on "How to Take Good Photos on Vacations -- 5 Basic Vacation Photography Tips" will provide you with some easy to use suggestions to improve the photos you take on your next scenic vacation! -- and also remind you to back up your non-replaceable Family and Vacation Photo Memories! -- Or -- use the easy Fill-in Form in the light blue box below and include a Photo! ** Lens Aperture Explained: (This is a little "Technical" since the "opposing" way the Lens Aperture and the lens "F/stop value work is kind of confusing.) -- The 5 Basic Tips above will help you improve your Vacation Photos without knowing this "Technical" Info -- If you are still interested -- Read on, but consider yourself warned! -- The Lens "Aperture" setting is usually shown as the "F/ stop or f/value -- example: F3.1 or f/3.1. The smaller the F-stop number or f/value, the larger the lens opening (aperture) to let light through. Smaller lens openings such as F/16 and F/22 (Larger lens Aperture settings) often are recommended for high depth of field Scenic and Landscape Photography (where near + far objects are in focus in the same photo) with good outdoor lighting for digital Photography on Vacations. If you are a Photographer ("Hobby" or otherwise) and would like to sell your Images online at a VERY popular Stock Image Photos Site, see more Info on setting it up at this link - Sell your Photos Online - You set your own image prices and can set up your own custom Photo "Watermarks" or Logos which show on all pre-purchase photos shown on this Photo Downloads Sale Site. I have used them for over four years and have been very happy with their service -- and have sold quite a few high resolution photo downloads using this popular Photo Sales Site! Top Pick Digital Cameras + Gene's Digital Camera "Reviews" and Top Picks on our Online Travel Electronics page -- Link drops down on page to a few easy to use "Point and Shoot" Top Pick Digital Cameras and Reviews. Top Pick Florida Vacation Guide Books: Vacation Florida beaches & Attractions Books & Guides. Vacation & Landscape Photography Books, -- or whatever! -- All with Candid User Reviews and often also, Item use Tips! Give us your favorite Vacation Photography Tip from the 5 -- or your additional comments regarding any of the 5 Tips -- or your added Favorite Vacation Photography Tip that is not one of the 5 now on the page? Share your Scenic Vacation Photography Tip (and an example Scenic Photo illustrating the use of your Tip if you want) with the Viewers of this page! Or just leave your Comments -- all are appreciated!!! Please only Scenic Vacation or Landscape Photos and no pictures with people's faces in them since can't use them on this web site without a "Model Release." Thanks! Give us your favorite Vacation Photography Tip from the 5 -- or your brief additional comments regarding any of the 5 Tips -- or your added "Non-Technical" Favorite Vacation Photography Tip that is not one of the 5 now on the page? Have fun doing your Text!!! If you choose to leave your e-mail address for a notification, it will NOT appear with your story on our web site and will ONLY be used to notify you as you request. We will not sell or share it. Do you have a Scenic Vacation picture to add? Great! Click the button and find it on your computer. Then select it. Now your Picture will appear with your comments! A picture Title or Caption helps, but is optional. Again, Please only Scenic Vacation or Landscape Photos and no pictures with people's faces in them. Thanks! Below are some other pages available on this US Beach Vacations Guide Site to help you in planning your next Memorable Beach Vacation. Why Florida Vacation Beaches? 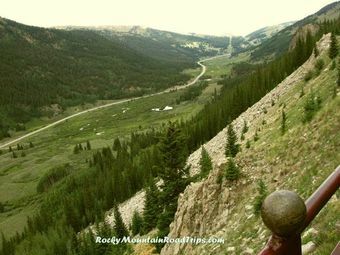 + "Must-see" Day Trip List - with Pictures, Information Links, Tips & Day Trip Ideas + times to allow for viewing Attractions. Daytona Beach Attractions -- Top "Must See" Daytona Beach FL Attractions - Daytona Beach and nearby points of interest and Attractions + Tips and "Reviews"
Virginia Beach, Boardwalk, and local area Attractions Virginia Vacation Beaches picture album + Reviews and Tips - Includes Cape Henry Lighthouse Pictures. Top Pick Books & Guides: Southeast Virginia vacation beach Guides + Attractions Guides. "Top Selections" Photo Album of -- GoUSVacations Photos from our 4 US Vacation Guide Sites - Now 135 location categorized "Top Pick" pictures selected from over 11,000 Scenic US Vacation Photos -- the Photo Selection Project that provided the "Stimulus" for this "How to Take Good Photos -- 5 "Non-Technical" Basic Vacation Photography Tips" web page to be built! Looking for Something Specific? Search 2 of our US Vacation Guide Sites.